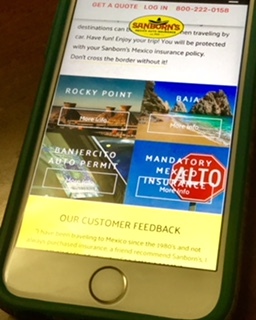 Whether you are among our regular visitors or just stopping by for the first time, the new Sanborn's Mexico Insurance website is designed to help you connect with us from your mobile device, desktop, laptop, or tablet. Information is now more easily accessible. Conveniently navigate the pages of our website and find the information you need on your cell phone or tablet. Look up information about getting your temporary vehicle importation permit online or find out about the ferry from Baja to the mainland. Read about "free zones" like Rocky Point in Sonora or popular destinations such as Baja. Find out why you need Mexico insurance and learn about the coverages available. Check our blog for the most up to date information about traveling in Mexico like the newly available online process to obtain your visa for Mexico. Our staff is ready to answer your questions about Mexico and find the best insurance coverage to fit your needs. Contact us by calling 800-222-0158 or by email at service@sanborns.com. You can also find an office near you with our new location finder. Have a look around and let us know what you think of our new website. We welcome your feedback and comments. Please also let us know if you cannot find something or would like to make a suggestion for new information or topics.